BetOnline is an Esports bookmaker that has been on the betting scene for a while now. This bookmaker was established in 1991, and ever since they were established, they thrived to be the best in the business. You will definitely find the best pre-match Esports betting odds on BetOnline. Furthermore, Esports betting at BetOnline is not the only thing this bookmaker provides. You can also place special bets on certain TV-shows, on other popular sports such as soccer, NFL, NBA, NHL, etc. Furthermore, you can also enjoy all the aspects of gambling with their poker tables, casino, and live casino. As mentioned above, BetOnline has been up and running for a while. They are licensed and regulated by La Republica de Panama. Furthermore, this Esports betting at BetOnline is definitely worth your money, especially after you read about their promotions. First of all, you can enjoy a 50% deposit bonus on your first deposit. However, if you are into cryptocurrencies, you can enjoy several deposits and reload bonuses. The first crypto deposit will stun you. You will be rewarded with 100% on your first cryptocurrencies deposit. There are also several reload bonuses for crypto deposits, and basically, you can get over 130% on your first deposit, which is really nice and unique. There are three ways of contacting BetOnline’s support. The main one is definitely live chat, where you can talk to an agent within minutes of starting a live chat. This support method is available 24/7, 7 days a week. You can also reach out to them via e-mail or you can even give them a call. Esports betting at BetOnline has reached its peak. This bookmaker is offering over 10 popular Esports title on which you can bet on. These are just some of those titles. As you can see from the list above, Esports betting on BetOnline is definitely a full package. You can find all sorts of Esports titles to bet on. However, the most popular ones are CSGO betting, followed by LoL betting. Overall, this is the best place for your Esports bets. 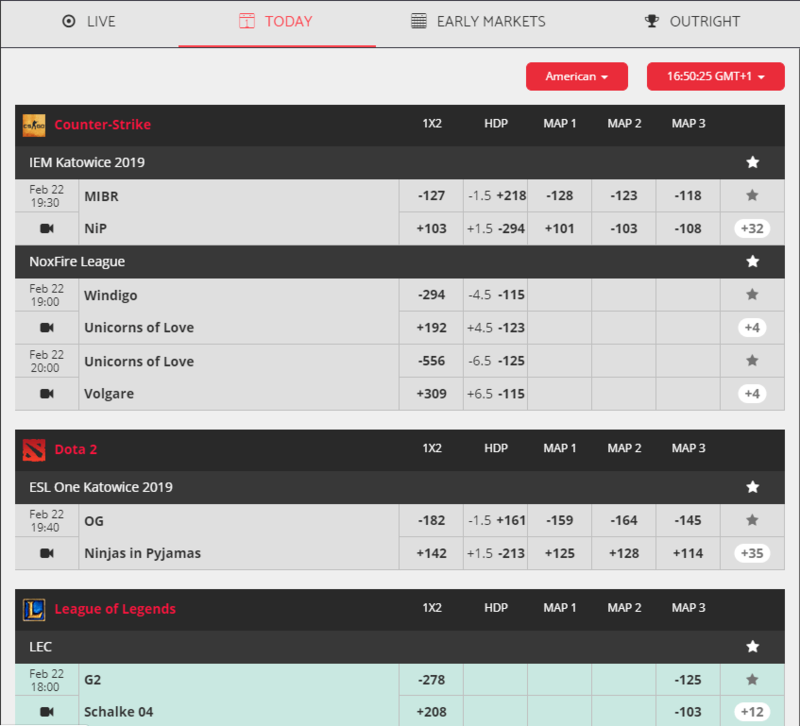 Given the fact that this bookmaker is offering crazy amounts of Esports to bet on, they also have to offer a lot of special bets and of course, outright betting is a must in this era. As we mentioned above, Esports betting at BetOnline is definitely providing you with a full package. For instance, there are over 20 special bets for the currently running CSGO event, IEM Katowice 2019. You will able to place special Esports bets such as round betting, first blood, map handicap, etc. You will also be able to bet on outrights. If you are not familiar with the term “outright”, we got you covered. You are basically betting on a final score of the event. For instance, you can bet that Astralis is going to win the next CSGO tournament. With these types of bets, you can enjoy the events to the fullest while you are cheering for your favorite team. Pre-match betting is a key part for every successful Esports betting bookmaker. BetOnline is not different from other popular Esports bookmakers. They are offering tons of pre-match bets, especially on CSGO matches. From what we were able to find out, you can find pre-match odds for not only high tier leagues and tournaments but for the lower tiered ones as well. Just like pre-match betting, live betting is a key part for every Esports betting fanatic. Furthermore, BetOnline has one of the most stable live betting sections. There are barely any blocked markets, which can not be said about their competition. When it comes to pre-match betting, you will enjoy really high odds at BetOnline. This is the main reason why Esports betting at BetOnline will be worth your money. However, they did not stop on pre-match odds, their live betting odds are also on a level above their competition. For instance, they are offering significantly higher odds than their competition, especially on the League of Legends, StarCraft 2, Dota 2, and CSGO. This welcome bonus applies not only to Esports but to every other market on BetOnline’s sportsbook. As we mentioned above, as a new player, you will be rewarded with a 50% deposit bonus only on your first deposit. However, there are a couple of catches with this welcome bonus. First of all, in order to qualify for this welcome bonus, you will have to deposit a minimum of $25. Furthermore, deposits made via Skrill and Neteller do not count, and you will not be eligible for this bonus if you deposit with any of these two methods. You will also have to roll over this bonus 10 times. Lastly, the maximum amount for this deposit is $1.000,00. Esports betting at BetOnline has never been easier. This Esports betting bookmaker thrives on the amount of secure and stable deposit and withdrawal methods. 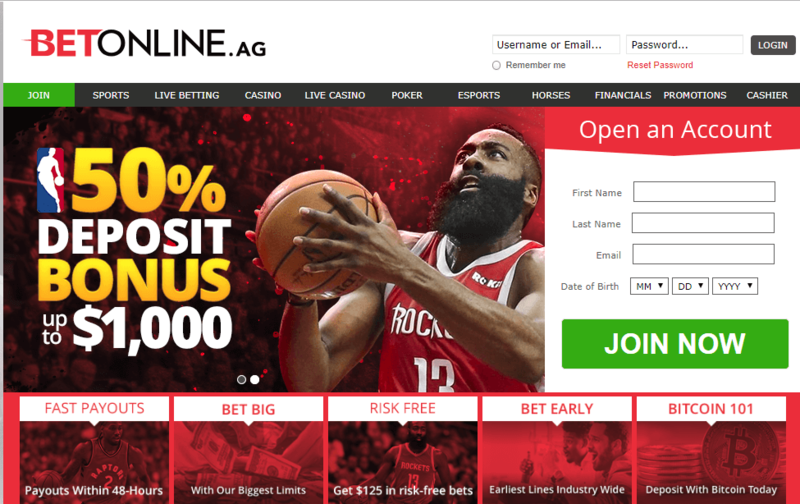 Another important thing about BetOnline is that they are a cryptocurrency friendly Esports bookmaker, and there is not many of those on the market. These are all the deposit methods provided by this bookmaker. If you ever run at a certain problem or simply have a query you want to be answered, BetOnline.ag has you covered. At the moment, there are three different ways to reach out to their support. This is not anything new or revolutionary, but it works like a charm. Firstly, you can reach out to them via phone number. To be honest, I really do not know who would like to use phone support for queries or problems, but if you are one of those people BetOnline.ag thought about you. This is the phone number where you can reach out: 1-888-426-3661. Last but not least, BetOnline.ag has live chat support which is available 24/7, 7 days a week. From what we were able to find out, all of the support staff was highly professional and polite. Alongside their manners, all of our questions and problems were resolved in no time. Lastly, there was barely any wait time, despite being in a queue. All in all, excellent live chat support.